My father joined the septuagenarian association last month and the man shows no signs of kicking up his heels and taking it easy. I work with the old bugger and he has no desire to quit the rat race and idly wait for the reaper to arrive. If The Man in Black decides to call upon him during office hours, he damn well better make an appointment. Many of our customers are simply dumbfounded that a man of seventy is still behind a desk. Although I was well aware that Bob Burns, gorilla man and movie memorabilia collector extraordinaire, remains a very active fellow (he was on the New Zealand set of Peter Jackson’s KONG), I had no idea that he continues to go gorilla. Considering the man is 71, I was shocked (and delighted) to see that he can still do what he does best. My dear ol’ pops is often quick to proclaim that he has no intentions of hanging it up because of one simple reason – he loves what he does. What a great reason to get up in the morning. I came across the articles below at the Classic Monsters Message Boards, a friendly and diversely populated forum of Monster Kids , both young and old. I highly recommend dropping by to peruse the voluminous posts on all manners of genre film minutia. The post dated back to the beginning of the year, but I stumbled upon it last month. The first story was posted by Bill Warren lifted from kongisking.net and the subsequent article was posted by another board member from a local newspaper. Mrs. Cleverly's 4th Grade class at Keppel Elementary School in Glendale, CA celebrated the last day of school before Xmas vacation by having a very special presentation about the Stop Motion SFX of the original 1933 KING KONG! The children learned about Willis O'Brien, and Marcel Delgado's pioneering work by watching and discussing clips from the new DVD release of the 1933 film, as well as a peek into the 21st century motion capture techniques used today by Peter Jackson for his new film. The children were then introduced to a real movie star... the original KING KONG himself! The kids were able to see up close, and touch Bob Burns' 70 year old King Kong armature used for the stop motion performance in the '33 film. After discussing pioneering SFX from the 1930's to the digital techniques used today, the children were told: "Sometimes... when stop motion, or digital SFX just aren't working for a shot... you have to use the real thing!" 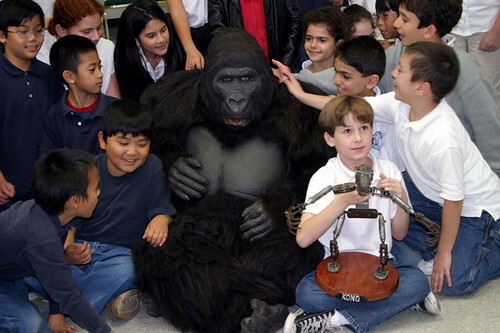 At that point the children were introduced to Kathy Burns (from the Gemora Institute for Gorilla Behavioral Research) who brought in a very special guest.... a 500 pound gorilla named KOGAR! After a little monkey business, (and terrifying a couple of kids!) it was revealed to the children that Kogar the gorilla was none other than Bob Burns himself! Bob explained to the kids how a performer in a monster suit (or gorilla suit in his case) uses body english and pantomime to create a realistic performance. Bob explained to the children how his mask and suit worked, as well as the history of man-in-suit performers like Rick Baker, and Charlie Gemora (one of the first men in Hollywood to create a realistic gorilla suit and performance). A very special day the kids will surely remember. Expert gets dressed up to teach lessons in film history to students at Mark Keppel Elementary. Kogar the gorilla grunted and pounded his chest as he walked, on his hands, into a classroom full of fourth-graders at Mark Keppel Elementary School. Students reacted with fear and curiosity as Kogar approached them, snorting and reaching out with his hands. Some jumped back and screamed while others waived hello to the gorilla. Little did some of the students know that Kogar was really Bob Burns, a gorilla performer. He was part of of a Dec. 22 presentation at the school on stop-motion animation. What does a gorilla costume have to do with animation? Burns, a film historian and archivist of movie memorabilia and props, and Chris Drake, a film and orchestral music composer, made a special appearance to talk to students about the new "King Kong" movie and the history of stop-motion animation in film. "I love telling people this stuff, especially the kids," Burns, 70, said. The presentation began with an introduction by Drake. He spoke to students about the making of the 1933 King Kong movie. The students viewed footage of the black-and-white film as Drake explained how puppets were used to create the stop-motion animation effect. The stop-motion animation process requires the puppets to be posed in different positions. The puppets are brought to life as each motion is filmed frame by frame, Drake said. "'King Kong' is an important movie as far as special effects," he said. "It was the first time an animated character was a main character." Drake brought out the original Kong armature that was built 70 years ago for the making of the 1933 version. The armature is owned by Burns, who also collects and displays movie memorabilia in his home in Burbank. "They used actors and they made King Kong robotical," Nerses Karadolian, 9, said. Students compared the special effects of the original King Kong movie to that of the new computer-generated Kong. They learned how the armature was used to make the gorilla come alive with the stop-motion animation techniques. Jihee Chung looked at the gorilla head with hesitation as the furry costume piece stared back at her. "They made the new one on the computer and the metal thing is over 60 years old!" the 9-year-old said. "They make King Kong as an armature and then they put cotton, and rabbits fur to make it look like a real gorilla" said Charles Solomon age 10. 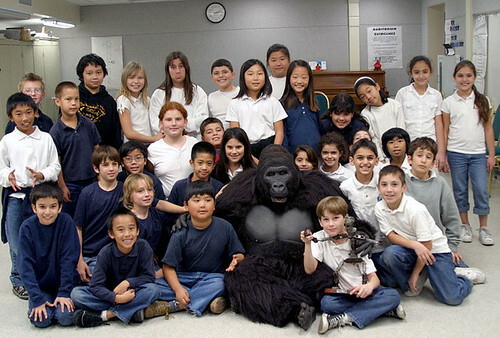 Burns answered questions from students as he stood in front of the class in his gorilla suit. Students asked questions ranging from how the suit was made to whether real gorillas grow to be 20 feet tall. "This stuff has to be remembered; it's film history," Burns said. "I want people to learn."